Stocks have swung around this week and will finish down just around three-quarters of one percent since last Friday. The media loves to make a big deal out of a daily decline in stocks, which they did this morning. But let’s look at some charts and some perspective. We’ve talked about the Fed’s actions this week. As I’ve said, with solid growth, low unemployment, subdued inflation and the risks outstanding that Brexit and/or a U.S.-China trade deal could go bad, they are in the position where they can telegraph flexibility in policy, which could even include a cut or more QE. Again, a lesson learned from the Fed’s mistakes of the past 10 years — set the expectations bar too low, not too high. This is now over 75 basis points lower than the peak in market rates in November. That’s a big adjustment. This means we’ve had nine quarter-point rate hikes by the Fed since 2015, for a total of 2.25 percentage points. Yet, if we look at the post-crisis low in market interest rates, which was just prior to the 2016 election (1.32% in July of 2016), this morning the market was only adjusting for about half of those Fed hikes. So, in November of last year, the interest rate market was pricing in nearly all of the Fed’s normalization in rates. Now, the market is pricing in just half of it. What does that mean? Again, as I said on Wednesday, I would say this is a market pricing in theworst-case scenario – a no deal with China. And I would say, at this stage, that’s an extreme view. Today, the German government bond yields slipped back into negative territory for the first time since 2016. Isn’t this, and the global QE-induced status of the U.S. yield curve, signaling recession ahead? 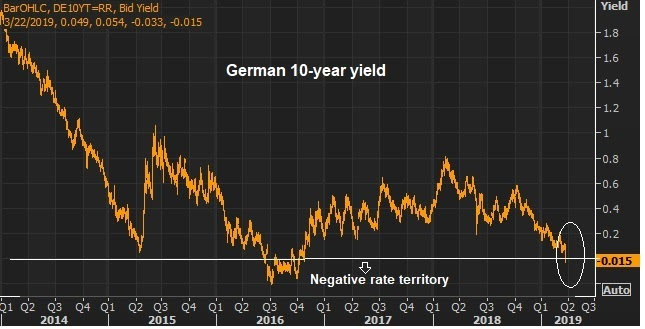 There was indeed some softer data out of Europe today, but the real driver of negative German yields is simply U.S. yields. The spread between German and U.S. 10-year yields, peaked last November at a record 278 basis points when the Fed was going one way, and the ECB was going the other. With the Fed and the ECB now facing virtually the same direction on monetary policy, that spread is narrowing. 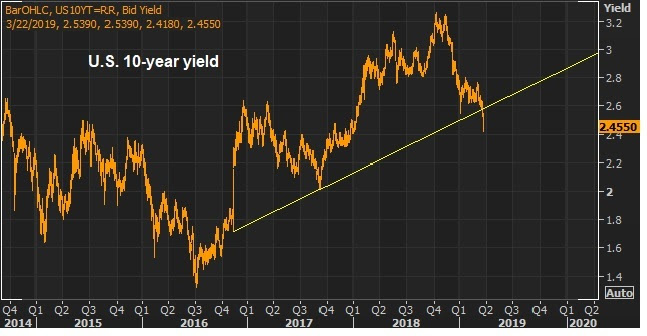 Bottom line, U.S. yields go down, German yields go down – especially given that the worst-case scenarios for both central banks (Fed and the ECB) are global growth oriented (namely, China). Does the interest rate market, which is reflecting a combination of pro-active central banks and market speculation on a worst-case scenario outcome, mean stocks should be going down? If we look back at the last time the Fed pivoted from hiking, to sitting on their hands … and the last time German yields were negative, stocks went UP. That was 2016. If you bought the S&P when German yields went negative and sold them when German yields returned to positive territory, you made about 4%. 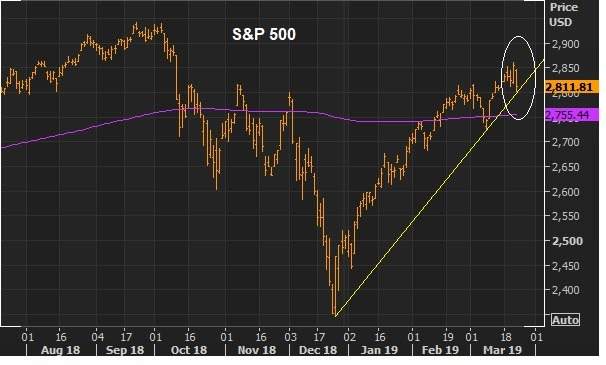 With this in mind, stocks run into this big trendline today and hold. This will be a key technical spot to watch. Bottom line: I suspect the bond move is way overdone, and stocks are a buy on the dip. Still, the swings in stocks and the recent memory of December, should have the Trump team inclined to get a trade deal done. Join me here to get my curated portfolio of 20 stocks that I think can do multiples of what broader stocks do, through the end of the year.